Kids with Sensory Processing Disorder are often labeled as having disruptive behavior, problems with social skills and difficulties learning. Without intervention, these children may slip through the cracks, performing poorly at school and suffering from depression and anxiety. Learn how to help your child with SPD at school, and give her the tools for success. According to the Sensory Processing Disorder Foundation, as many as one in 20 children’s lives is affected by SPD. That’s a lot of school children. Despite this statistic, your child’s teacher may not be familiar with Sensory Processing Disorder or ways to handle it in the classroom. To make matters worse, SPD is rarely recognized in students without other disabilities. As your child’s greatest advocate, you can work with your child, his school’s administration and his teachers to help him enjoy learning and spending time with peers. If your child has been diagnosed with autism spectrum disorder or a learning disability, her school should already have interventions in place. Make sure school staff is up to date and understands your child’s specific sensory dysfunctions and needs. If your child doesn’t have an IEP or a 504 Plan, schedule an appointment to talk to the guidance counselor and principal at your child’s school. Bring a letter stating your child’s diagnosis, the current treatment plan outside of school and interventions that may help in the classroom. Talk to your child’s teacher early and often about your child’s progress and behavior. Ask your child’s Occupational Therapist to share hand-outs and suggestions to pass on to your child’s teacher. Many kids with SPD struggle with what they’re expected to accomplish during the school day. This can involve self care, such as getting dressed and undressed to use the bathroom, or can be as simple as sitting still to work or having enough energy to get through the day. 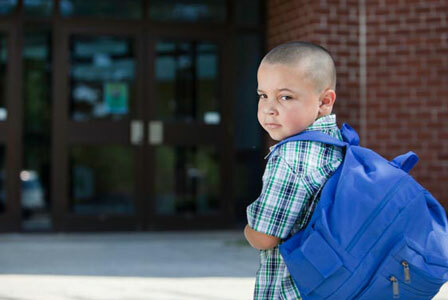 Your child is expected to behave differently at school than at home, and may be required to uphold more rigid standards of behavior and performance. Give your teacher tips that are specific to your child. Is your child struggling to sit still? Ask the teacher if he can be assigned classroom tasks that double as heavy work, such as moving bins of toys or helping erase the white board. Does your child need oral input to focus? Ask if he can bring gum to school for tests and quiet work time. Sensory Processing Disorder isn’t a free pass for your child to disrupt the classroom. Let your child’s teacher know that you understand the need for discipline, just as you make it clear that disruptions are often the result of sensory issues that can be lessened with the right therapies and accommodations. It may be an awkward dance while you get on the same page, but it’s worth it. Approach your child’s progress as a team. It’s crucial to involve your child and communicate her responsibilities. She needs to learn to communicate her needs and ask for help. Teach her that she is “the boss” of Sensory Processing Disorder and has the right to succeed at school.